1 This beef topping is simple as pie. Get your pan nice and hot over medium heat. Pour some oil and throw in the bell peppers, corn and ground beef. 2 Pour Knorr Liquid Seasoning and tomato sauce then simmer for 5 minutes and that’s our dish! 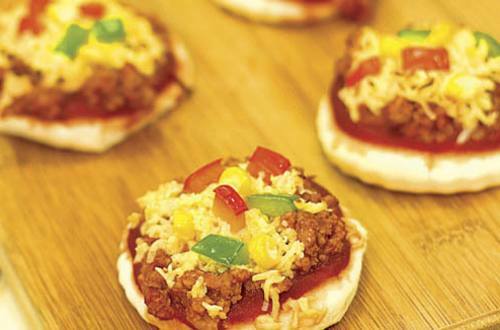 3 Let’s now assemble our mini pizza crusts. Add the cooked toppings and top them with grated cheese. Bake in an oven or oven toaster until the cheese is melted. 4 Be confident as you present this dish to your family. They will definitely be impressed because it will not only look fun but it will also be tasty. Totally yum!